President Muhammadu Buhari has again praised his predecessor, Goodluck Jonathan, for peacefully handing over in 2015. Mr Buhari in 2015 became the first opposition candidate in Nigeria to win a presidential election after defeating Mr Jonathan. Since then, Mr Buhari has repeatedly commended Mr Jonathan for peacefully handing over. The president reiterated his stance Thursday night when he hosted members of the Kannywood entertainment industry to a dinner at the Presidential Villa, Abuja. Mr Buhari, who recalled his political struggles since 2003 when he made his first attempt to clinch the presidential seat, lauded Mr Jonathan for accepting defeat in the 2015 general elections. 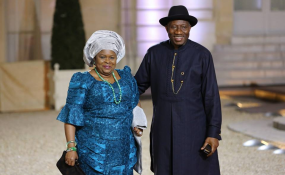 "I'll continue to hold former president Jonathan in high esteem as a result of that singular act. "He (Jonathan) was in power as Deputy Governor, Governor (Bayelsa), Vice-President and President, all for about 10 years and he voluntarily accepted defeat and surrendered power to me," he said. The president also reassured that the brutal activities of the Boko Haram sect would soon become history. He said the federal government would not allow any group hiding under religion to unleash terror on innocent citizens. Mr Buhari, who spoke in local language, said: "It's totally wrong for any believer in God to kill innocent people either in the Mosque, Church or the market place. "You can't be shouting Allahu Akbar (Allah is Great), Allahu Akbar, and killing innocent citizens and destroying properties all in the name of God. "It is either you don't know what you are saying or you don't even believe in the existence of God Almighty. God has nothing to do with injustice. "So, now we are confronting them and by the grace of God we will destroy them." The News Agency of Nigeria (NAN) reports that Governor Nasir El-Rufai of Kaduna State and his counterpart of Plateau, Simon Lalong as well as presidential aides were among the personalities that attended the event.